The word for truth in Sanskrit is Satya. In our current climate, individually, politically, socially and spiritually, it feels more than ever that satya is to be studied. But how do we do this without asserting that our views, our perception, is better than the other guy? How can we be sure that we are on the side of truth? Something to take note of is that Truth can be fact, but it is not always fact. If truth were fact, it would take care of all the court cases in the world. In other words, this is the fact; therefore this is the result. But, as you know, in a court of law, fact is a part of the truth, but not the whole of it. So, what does satya mean in Sanskrit? And how do we approach satya from a yogic perspective? The word satya derives from the Sanskrit root AS, which means to be. When you are forming the word, according to grammatical rules, you have to flip the root around and add a dental ‘t.’ Thus, yielding ‘Sat.’ Sat is being or beingness. Sat is often translated as ‘the highest’ for example in the words, Sat Guru which then due to sound laws becomes Sad Guru, highest teacher. In the Sanskrit Tradition, it is beingness that is truth. Now the question becomes what does that even mean? And how do we get at beingness? This may sound repetitive to what is piped out daily on social media and in yoga circles, but my suggestion to arrive at truth is to meditate. My guru, Shri Brahmananda Sarasvati, said, “All wars are the result of the disturbed mind.” When we disconnect internally, we see separation. When we feel what we are beyond form and mind, we only see connection and oneness. Meditation is a tool to help you get beyond your thinking mind, as well as, to enable you to feel what you truly are: Beingness itself. Once this skill of being with what you are is firmly established, you will be able to guide the energy that is under your mind properly. Daily, in your meditation practice saying: Although I have a body and mind, I am not just the body and mind. Then be with the watching. As this understanding rises more and more the concept of separation won’t even be on your field because through meditative life you’ll live in the understanding that we are all beyond form, we are all one light. As I write this, I can hear the possible prickly responses, the puckered, the tightening. I’m not suggesting that you don’t stand up for what you believe in. Or that you should only meditate and not rally the battle cry against injustice, racism and cruelty of any kind. I agree wholeheartedly and will join you in that shout. But is it possible also to pursue a deeper conversation? One which nourishes and supports you on an inner level, not so that your voice is louder, but so your conviction is integrated instead of righteous. So, your voice rises through your inner connection with your Self making it much more powerful. In his Yoga Sutra, Patanjali says, Heyam Duhkham Anāgatam PYS 2.16 which says, future suffering is to be avoided. How do we avoid suffering? There are several answers to this depending on how the sutra is applied. One is that through yogic inquiry, you learn to extend out with kindness and awareness to your fellow humans, animals and nature around you. which says, when the yogini-in-training is established in Satya, there is great strength and fruition in all of her actions. Practicing being with satya means to practice living in the Satya-Loka. Satya-Loka translates in Sanskrit as the realm of the highest truth. It is not a land or a station that you go to where everyone is speaking truly. 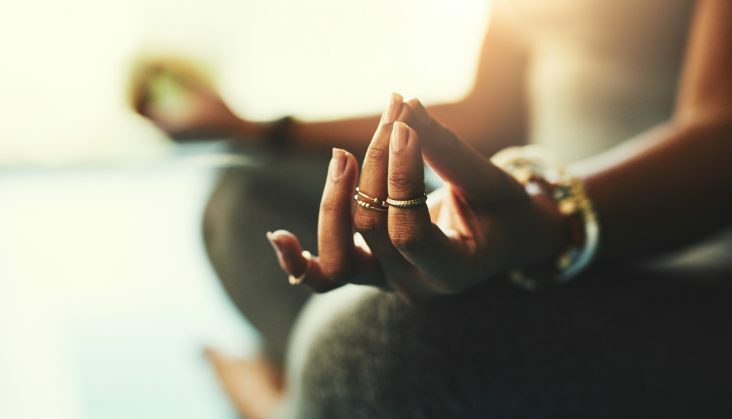 It is a place of deep connectivity and grounding within yourself that comes when you consistently engage your practice. This Oct 20th, 2018 Manorama will share with you the beauty and mystery of the Sanskrit language. In the Sanskrit Studies Method, Sanskrit Level 1 Year-Long Teleclass Training, you will study the Sanskrit language, immerse yourself in the path of yogic unity, learn about the intricacies and beauty of Sanskrit through the study of mantras, grammar and sutras. Be inspired, Learn tools to support your growth. Develop real confidence. 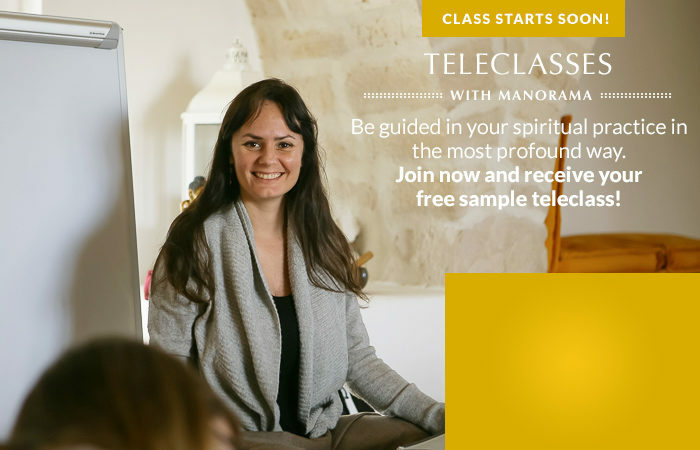 In these sessions, Manorama shares key Luminous Soul principles, mantras and stories that support yogic clarity, connection with self and harmony in life. You will learn how to work with and develop the building blocks of Luminous Soul: Yoga Philosophy, Mantra & Meditation. And you will be empowered to apply these core principles and practices in your daily life. This year commit yourself to developing regular meditation sessions, watch the value of this work unfold in your life and provide your self with the opportunity each month to ask Manorama questions about your practice. This course is an immersion into the Sanskrit language through the study of the Sanskrit alphabet, including asana names, select mantras, and Luminous Soul Meditation and principles. Thank you so much for the wonderful Sanskrit workshop! You are an incredibly inspiring and gifted teacher.